The men's team has won every game after an opening-day loss. Coming off of their first ever NESCAC championship, men’s basketball had sky high confidence and expectations heading into the 2015-16 campaign. But after a surprising loss against Lyndon State College to kick off the season, the team headed into Thanksgiving week with a disappointing 1-1 record after a win against Clark University. First on the docket was an away game at Bard College last Tuesday. The tilt against Bard started out scary, as the home team raced out to a 28-15 lead. But that was nearly erased by the half, as a jumper by BJ Davis ’16 made the score 38-37 as the teams headed into the locker room. Rashid Epps ’16 put the Cards ahead with an and-one, and Wesleyan never looked back. A late run by the Raptors kept the game close, but they would never regain the lead as the Cards secured an 80-74 victory. Davis had a huge outing, as his ability to draw contact was crucial in forcing Raptors into foul trouble. He finished the contest with 31 points to go along with five boards. Epps also had a nice game with 13 points and nine rebounds. After a turkey leg (or two) the team headed to Union College for the Union Classic Tournament over Thanksgiving weekend. The Redbirds drew a first round matchup against the Golden Knights of Clarkson University, who entered the game with just one win against the weak SUNY Potsdam Bears. As expected, the game posed little trouble for the Cardinals. After a bit of a sluggish start that saw Clarkson take a 20-18 lead, Wesleyan caught fire and went into the break up 46-27. The second half was no more difficult and the Cards coasted to a 76-49 victory. Wesleyan’s scoring effort was very balanced, as Davis, Epps, Joseph Kuo ’17, and Joe Edmonds ’16 each reached double digits. Epps and Kuo also had three blocks apiece, while Davis also tallied six assists and a steal. In the tournament’s championship game, Wes took on Union, the tourney’s hosts. From the get-go, it was clear that both teams were going to shoot the three as often as possible. When the dust cleared, Wesleyan ended up with 10 treys in 21 attempts, compared to 12 of 31 from Union. The Cards took a sizable 12 point lead into the half, but the Dutch cut into the deficit to one, 74-73 Wesleyan, with two minutes to play. From that point on, Davis made seven of eight free throws to seal an 81-77 Wesleyan victory. Davis scored 25 points in the championship victory, and was named MVP of the tournament. Kuo had a double-double with 10 points and 12 rebounds to earn All-Tournament honors alongside Davis. PJ Reed ’17 shot the ball very well, going 4-6 from beyond the arc on the way to 14 points. Captain Jack Mackey ’16 has been frustrated by an injury that has forced him to sit out a large portion of the team’s recent games. While he was happy to have won the tournament, he stressed that the team needed to make sure it was learning as much from its wins as it did from it season-opening loss. 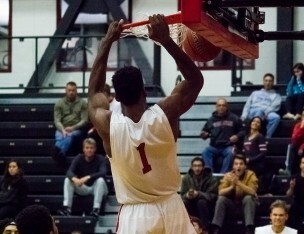 On Wednesday night, the Cards took on the Massachusetts College of Liberal Arts at home. Harry Rafferty ’17 sparked the Cards to a strong start by scoring six points in the first five minutes. He would end up with 12 points at the break, while his team held a 45-31 lead. While the scoring load was a bit more balanced in the second half, Rafferty added another seven points on the way to an 85-75 victory. Along with Rafferty, Kuo had a great outing with 18 points, eight rebounds, and a block. Davis had another solid game, putting up 15 to go along with four boards and five dimes. At the end of the game, Wesleyan’s record stood at a very respectable 5-1, albeit without any conference games under their belt. Much of that success can be attributed to the scoring of Davis, who has significantly elevated his game from last season. Davis’ outstanding performance so far this season drew generous compliments from his teammate Mackey. Coming up for the Cards is a huge away game against Williams, who also beat MCLA and have yet to come particularly close to losing a game. A win against the Ephs would send a huge statement to the rest of the conference that Wesleyan is serious about repeating as conference champs. Despite the magnitude of the contest, Davis says the team’s preparation will be the same as always. Mackey wholeheartedly agreed, adding that their win streak would not cause them to get complacent. Nice to credit the photo but it would also be nice to identify the subject of the photo.